"It's stories and quotes like this that prove the point that some have been making about switching from mpg to gallons per mile (gpm). Vehicles with lower fuel efficiency had the smallest drop. The V8-powered Mercury Mountaineer has a fuel economy of 23.8 mpg at 55 mph and that drops to 21.2 mpg at 65 and 17.8 at 75 mph..
That is just so misleading. In gallons per mile, the Insight drops from 1.93 gallons per 100 miles to 2.74 gpm. That's a difference of 0.81 gpm. The Mountaineer drops from 4.20 gpm to 5.62 gpm, a difference of 1.42 gpm. So not only are starting off at twice the inefficiency, you end up losing almost twice as much. 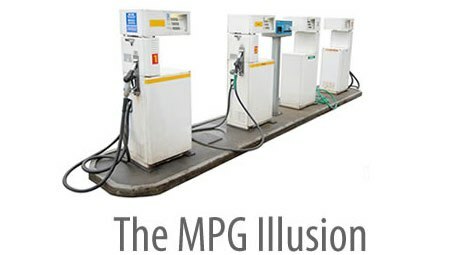 This is exactly the misleading nonsense a switch from mpg to gpm would fix."